I’ve become a bit obsessed with Japanese food over the last 6 months so Koya was an obvious choice for the first stop of my epic London trip last weekend. Koya is a Japanese restaurant in Soho that specialises in Udon noodles, it’s got a great reputation amongst bloggers as well as winning several awards from the likes of Observer Food Monthly and a prestigious Michelin Bib. 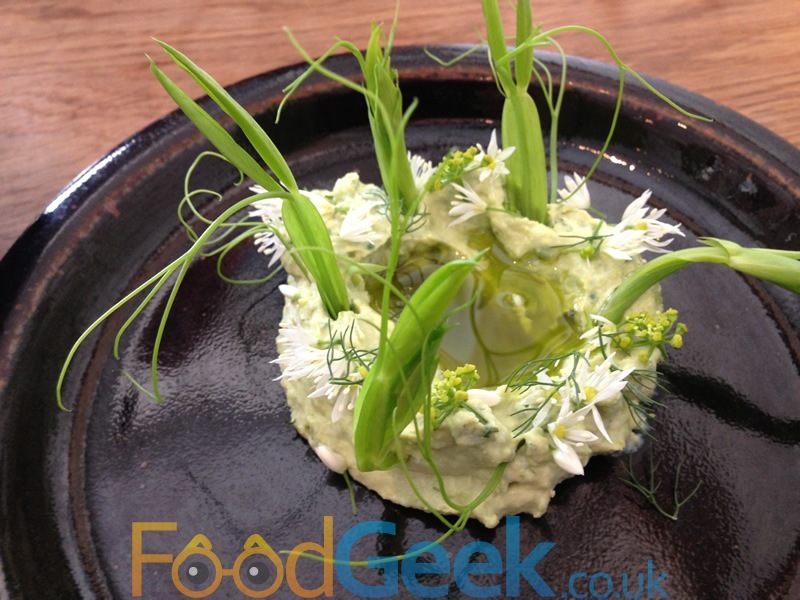 It was also listed as the 35th best restaurant in the country in last years ‘National Restaurant Awards‘. They don’t take bookings and i’d heard they get very busy at lunch time so after arriving in London at 11:42 we dashed across the city dragging our cases behind us. We made it in record time, just 10 minutes after they opened! The restaurant was already half full, we gladly accepted one of the few remaining tables. It was completely full within 30 minutes and people were being turned away or queuing outside. 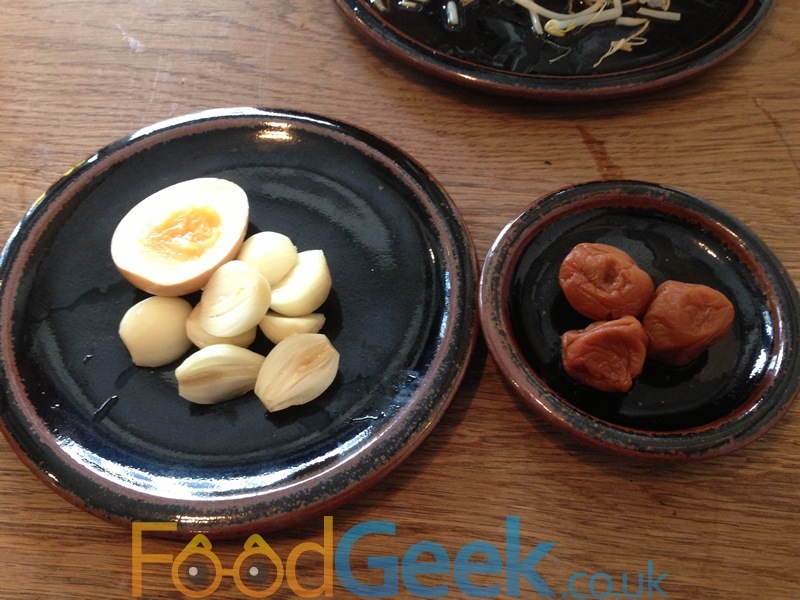 ‘Pickled Baby Onions & Egg’ and ‘Umeboshi’ (Pickled Plums). I’m a big fan of pickling, I don’t think i’ve ever come across anything pickled that I didn’t really like but the plums pushed this to the limit. Not unpleasant but certainly odd in both taste and texture and extremely sour. 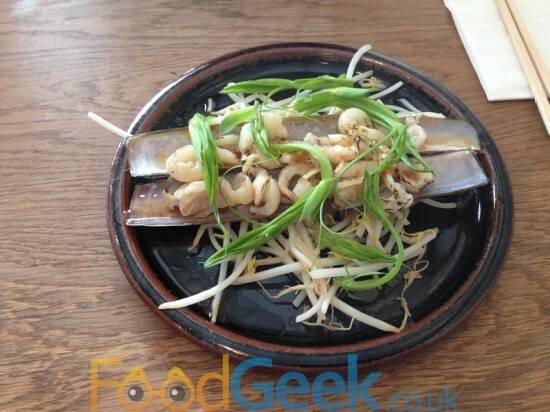 ‘Razor Clams, Beansprouts & Wild Pea Shoots’ from the specials board was simple but delicious. The razor clam seared so quickly it was wonderfully juicy and soft without a hint of chewiness and dressed very lightly with soy. 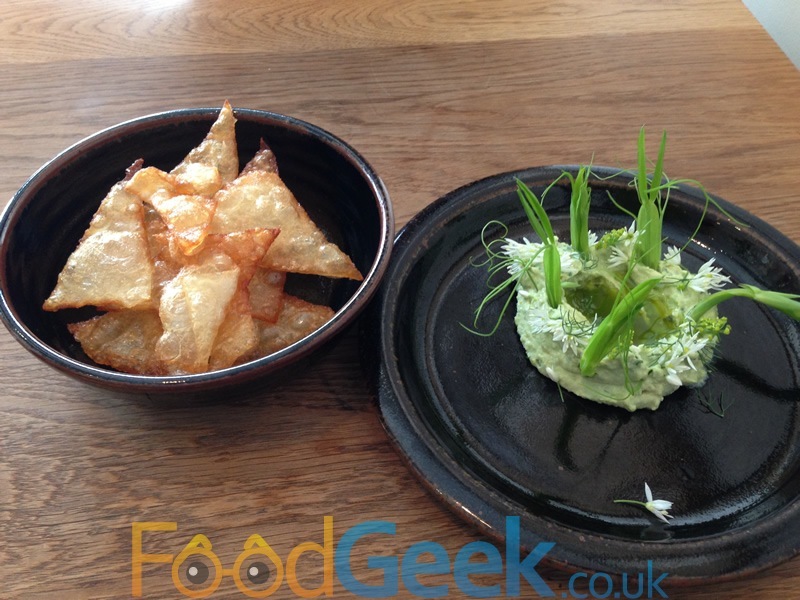 The best of the small plates was from the specials board too ‘Broad bean, Pea, Tofu & Early Summer Herb Guacamole with Udon Nachos’. The herby guacamole looked beautiful and tasted just as good, I love traditional Guacamole and whilst this was completely different it’s equally delicious and has opened my eyes to a whole new realm of possibilities! The Udon nachos were far tastier than the Mexican tortilla variety too. 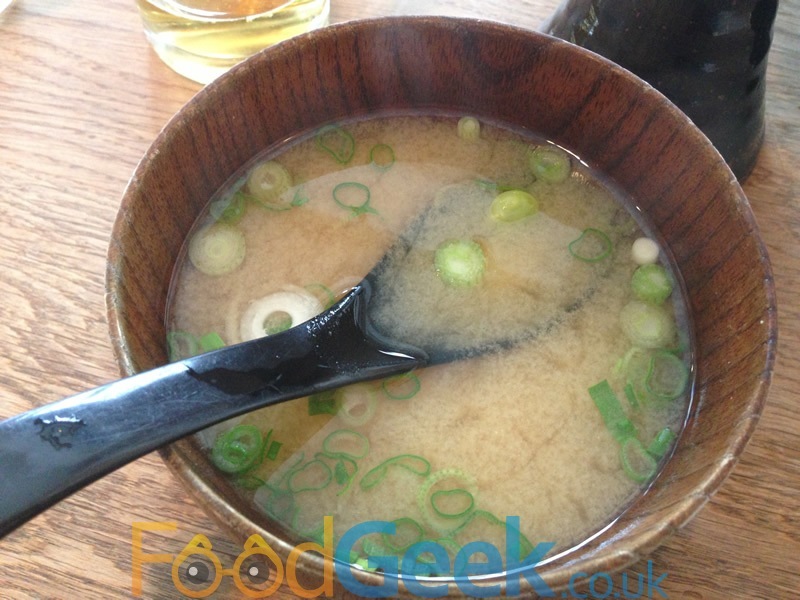 It would be rude to visit a Japanese restaurant and not order miso soup so being a polite chap I did just that. Every version is slightly different and Koya was no exception, it had a background taste of sesame which was very enjoyable. 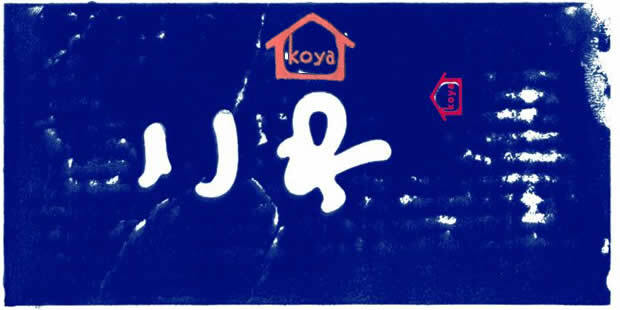 Koya is best known for it’s noodles which are made freshly every day in house. I ordered ‘Kinoko Atsu-Atsu’ a walnut & mushroom miso dish. As soon as I saw it I knew I was going to love it but it was even better than I expected. Firstly the noodles are incredible, soft and stretchy and so utterly slurpy. I’m not generally a slurper but it was impossible not to with these. 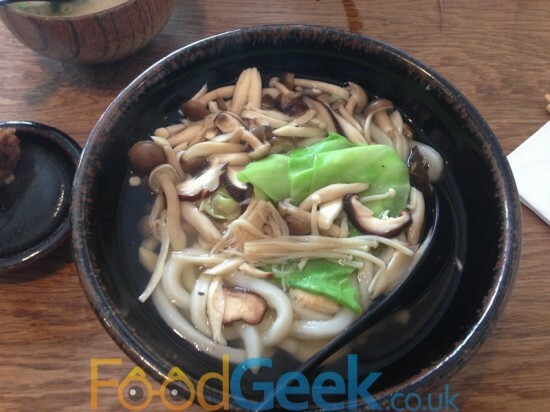 It was packed with spring greens and various mushrooms including my favourite enoki’s. A combination of red & white miso pastes mixed with walnut puree was served on the side and when stirred into the broth transformed it into one of the most delicious bowls i’ve ever eaten. Salty, sweet and savoury with crunchy walnut bits. It was just brilliant. I later found out that the dish was included in TimeOut magazines ‘Top 10 Dishes In London’ last year which it certainly deserves. Mrs FG has always been more sensible than me and felt that with summer finally arriving and it being over 22degrees outside a cold dish would be a good idea. 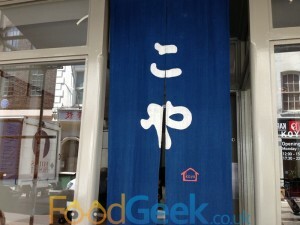 Koya cater for such occasions with their selection of Hiyashi dishes which are cold udon with cold sauce to pour over. She want for ‘Hiyashi Saba’, a bowl of noodles which were every bit as good cold as they are hot topped with stunning smoked mackerel and a variety of green vegetables. The cold sauce added a delicious savouriness whilst the wasabi on the side was one of the best i’ve ever tasted. 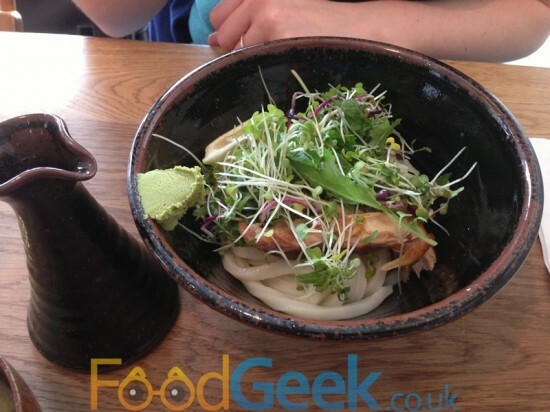 Although I loved my Atsu-Atsu this dish was fantastic too and definitely a wise choice on a hot summers day. Like most Japanese restaurants, Koya don’t offer much in the way of dessert. Not a problem as we had more places to eat at over the next few hours anyway. I finished with a cup of homemade ‘Hot Ginger’ which was lovely, slightly sweeter than I would have liked but I enjoyed it all the same. So I love Koya, it was very busy but service was efficient throughout and though the Japanese waitress spoke little English she was polite and friendly. Tables turned around quickly which is just as well since there was quite a queue outside when we left. Most of the customers seemed to be Japanese which I always think is a great sign of authenticity and though it’s certainly not cheap I found it to be very good value overall and will definitely be returning.